The Bay Area real estate market today favors trade-up buyers. The Bay Area’s real estate markets are poised for a busy year ahead. Buyers are eager and anxious. The pent-up demand that sparked bidding wars and pushed home sales into record territory in 2012 shows no sign of slowing down in 2013, as buyers rush to take advantage of bargain-priced properties and mortgage rates still hover near historic lows. Now it’s time for sellers to join the party. With the U.S. economy on the mend and home prices rising, many sellers are entering a sweet spot where they’re able to get desired sale prices and then save tens of thousands of dollars as they trade up to more attractive homes themselves. Some people who believe their home is still underwater – that they owe more on their mortgage than the value of their home – may be wrong. Home values have risen solidly across the Bay Area over the past year, boosted not just by the improving economy but also by bidding wars and homes selling over their asking prices, which may raise the value of comparable nearby properties. A home that may have been valued recently at $500,000 could be worth significantly more today because of comparable neighborhood sales. It takes the expertise and advice of a real estate professional who knows the local market to help assess a home’s current value and prospects for a sale. The Bay Area real estate market is one of the hottest in the nation, evidenced by the return of bidding wars that have pushed sale prices for many desirable properties tens of thousands of dollars above list prices. A steady decline in the number of available properties on the market has fueled the anxious bidding. 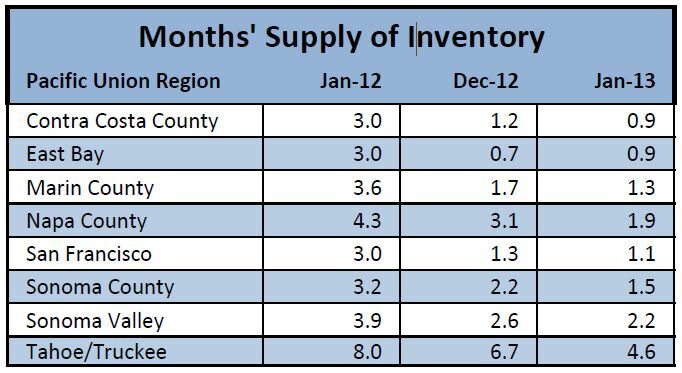 “Months’ supply of inventory” (MSI) is a common real estate metric, measuring how quickly the current supply of homes would be sold at the present sales rate. An MSI between four and six months is considered a balanced market, and the Bay Area today is decidedly out of balance – in favor of sellers. In Pacific Union International’s East Bay and Contra Costa County regions, the current MSI stood at 0.9 months at the end of January, both down from three months’ supply a year earlier. That number suggests that buyers are snapping up many homes just a week or two after they hit the market. In San Francisco it was hardly better with an MSI of 1.1. Except for a rare improvement in the East Bay in January (it had decreased to 0.7 in December), the MSI has been falling steadily across the Bay Area throughout the past year. Still, buyers remain undaunted. The Bay Area market share for homes priced below $500,000 grew 9.2 percent from 2011 to 2012, while Pacific Union’s share did markedly better, rising 33.7 percent. For homes priced $500,000 to $1 million, the Bay Area market share grew 23.3 percent — and 40.9 percent at Pacific Union. The market share for homes priced $1 million to $3 million grew 33.7 percent in the Bay Area, and 41.1 percent here at Pacific Union. The numbers suggest that Bay Area home prices will continue to appreciate throughout 2013. Sellers looking to trade up to a higher-priced home are in an enviable position today. Real estate professionals know that in a recovering market, price appreciation starts at the bottom and moves up. That means sellers are generally able to get a higher price for their home while locking in savings as they trade up to a more expensive home. And those savings multiply as the value of the trade-up home increases. Even when price appreciation is flat across a market, trade-up buyers stand to make significant gains. For example, consider the homeowner whose property was valued at $300,000 in 2006 but experienced a 20 percent drop in value to $240,000, for a loss of $60,000. That same 20 percent drop in value for a higher-priced home – say, a $450,000 home now valued at $360,000 – gives the trade-up buyer savings of $90,000, or a net gain of $30,000 on the new home. Looking for another reason to trade up sooner rather than later? Interest rates today make homeownership a bargain we haven’t seen in decades, but the low rates won’t last forever. For much of 2012, interest rates remained near 3.4 percent, but they are starting to creep higher. Last week, Freddie Mac reported that 30-year fixed-rate mortgages averaged 3.53 percent, up from 3.42 percent the week before, and a report from the Mortgage Bankers Association predicted that rates will average 4.4 percent by the end of 2013. That one-percent rise in mortgage rates will add $225 to the monthly payment on a $400,000 mortgage. Another way to view mortgage rates is to look at the increased buying power of today’s low rates compared with the recent past. In 2002, for example, when the interest rate on a 30-year fixed-rate mortgage stood at 6.5 percent, the monthly payment on a $500,000 loan was $3,132. Today, that same loan payment would buy a home with a $700,000 mortgage – an incredible net gain of $200,000. Sellers may have had good reasons to hold onto their homes as the housing market foundered, but after five or six years of inactivity the urge to move on and up is hard to resist. Look to your Pacific Union professional for expert advice. And welcome to the party!